The fairly peaceful demonstration was a stark contrast to scenes Sunday and Monday when far-right demonstrators clashed with counterprotesters over the fatal stabbing of a 35-year-old German man in a brawl.Two men — an Iraqi and a Syrian — have been arrested in connection with the stabbing. Chemnitz Mayor Barbara Ludwig was booed as she addressed about 600 people inside Chemnitz stadium alongside Saxony's state premier, Michael Kretschmer.Ludwig said "it was difficult" for authorities to decide what to do about the violence, prompting one local resident to shout: "Well, this is your job! "The mayor went on to say that "one could have mourned in silence after the fatal stabbing," but not by marching violently through the city. As Kretschmer asked residents for a minute of silence, chanting from far-right protesters could be heard outside the stadium. Protesters at the rally organized by local right-wing extremist group Pro Chemnitz chanted "lying press," a sign of the sentiment regarding the media coverage of the stabbing. Police said about 500 people had registered for the demonstration.Additional officers have been drafted in from Bavaria, Berlin, Hesse, Saxony-Anhalt and Thuringia as well as from the federal police after criticism that authorities allowed the previous protests to get out of hand. Police in the northern city of Wismar said three German men attacked a 20-year-old Syrian man Wednesday night as he made his way home alone. He was subjected to xenophobic insults, punched, kicked and hit with a chain, suffering a broken nose and bruising to the face and upper body, a police statement said. Police are investigating the attack as a hate crime.Separately, police said, unknown offenders defaced the windows of the office of the far-right Alternative for Germany party, or AfD, in Wismar's old town with stickers and paint. Officers are investigating.The rallies earlier this week were the latest examples of division in Germany triggered by the country's intake of refugees and migrants.The demonstrations were condemned by Chancellor Angela Merkel, who said "hate in the streets" had no place in Germany. She also condemned the fatal stabbing, saying it was "a horrible incident." A court official in Dresden admitted leaking the arrest warrant for the two suspects in the German man's fatal stabbing that sparked the anti-immigrant protests, the state Ministry of Justice said Thursday.The document was shared thousands of times on social media. The publication of an arrest warrant is punishable under German law. "We cannot tolerate this in any way when an employee acts like this, and there will be consequences," Saxony's minister of justice, Sebastian Gemkow, said in a statement.The court official has been suspended with immediate effect, the Saxony Ministry of Justice said. He has not been named.Earlier Thursday, a local politician was placed under police investigation for sharing the document online. Jan Timke is a member of the Bremen parliament in the country's north and the right-wing association Citizens in Anger. He's also a former police officer and current member of the German Police Union. "Jan Timke could face a fine or imprisonment for up to a year" if he is found to have done this, Bremen prosecutor Frank Passade said.Timke admitted to sharing the warrant on social media but told journalists in Bremen he was not the source of the leak, CNN affiliate NTV reported. He said he was not aware at the time that doing so was illegal. "Of course I take responsibility for the publication," Timke said, before adding that he viewed the police search of his home as unlawful. CNN has reached out to Timke for comment.Pro Chemnitz also posted the arrest warrant on social media, inflaming an already tense situation. Facebook took the document down, but not before thousands of people shared it. In the warrant, it appeared at least one of the suspects already had a criminal record. Its apparent leak has prompted speculation that there may be links between members of the police or prosecutor's office and far-right elements. The document fueled local anger that it took so long for the authorities to reveal the suspects in the fatal stabbing were asylum-seekers and prompted suspicions of a cover-up.Pro Chemnitz has protested against Facebook's removal of the document and said Thursday's demonstration was even more important than the earlier one after the social media platform's action.The group's Facebook post promoting Thursday's rally said: "Criminal foreigners cannot be tolerated, they need to be immediately deported and together we will explain this on Thursday to the state premier. "The AfD and the right-wing, anti-Islam Pegida group, which was founded in Saxony, have called for further protests Saturday. Concern over possible sympathy for far-right causes within the police and armed forces may have increased with two recent cases.A police officer in the southwest German city of Trier was fired this week after being exposed for identifying with the Reichsbuerger movement, an extreme right-wing group.A statement from the administrative court in Trier said the officer "was guilty of serious misconduct" and no longer recognized the country's constitutional system or laws, making him a potential threat to public safety.Separately, Saxony police said Thursday that a police employee had left the service after revelations he attended a Pegida rally on August 16 while off duty and called the police on a TV crew covering the event, labeling them as "lying press. "Ten people are being investigated over Nazi salutes, an illegal gesture in the country, during Monday's protest in Chemnitz. 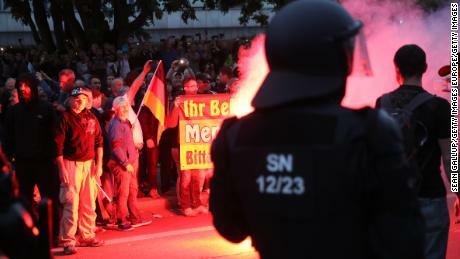 Social media video from the protests showed scuffles and far-right demonstrators chanting, "German, social and national. Free, social and national," phrases heavily associated with the neo-Nazi movement.There were around 1,500 counterprotesters Monday night, vastly outnumbered by the 6,000 far-right demonstrators, many of whom had traveled from other states to Chemnitz, Saxony state police said.The AfD, which campaigned on an anti-immigration, anti-Islam platform, won more than 25% of the vote in the state of Saxony in last September's federal election, almost double the national average. 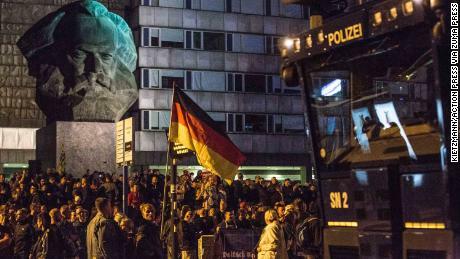 CNN's Nadine Schmidt reported from Chemnitz, and Laura Smith-Spark wrote from London. CNN's Atika Shubert, Judith Vonberg and Eliza Mackintosh contributed to this report.